Need a new recipe for green beans? 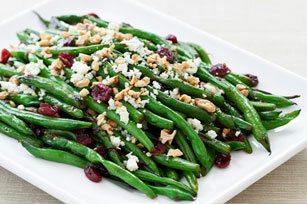 Be sure to try our recipe for Green Beans with Walnuts, Cranberries and Feta. It hits all the right flavour notes: sweet cranberries, nutty walnuts and savoury feta cheese. Cook beans in large saucepan of boiling water 6 min. or until crisp-tender; drain. Return beans to pan. Add dressing; mix lightly. Cook and stir 1 min. or until heated through. Spoon onto platter; top with remaining ingredients. When a recipe calls for toasted nuts, there's no need to heat up the oven. Simply toast the nuts for a few minutes in an ungreased skillet on medium heat just until lightly browned, stirring frequently. Prepare using toasted chopped pecans or hazelnuts.